Set in Parioli, Rome's most elegant residential district, Aldrovandi Residence City Suites offers a quiet green location and comfortable suites, complete with fully equipped kitchenettes and free Wi-Fi access. 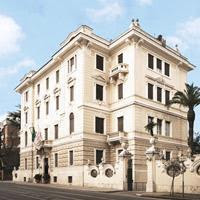 Aldrovandi Residence City Suites is near the Bioparco (Rome's zoological garden) and faces the Villa Borghese gardens. Public transport connecting to Rome's historic city centre is just a short walk from the Residence. In the summer, relax in the outdoor pool. Aldrovandi Residence City Suites is surrounded by palm trees and typical Mediterranean greenery. Stay in spacious suites with the modern comforts of self-catering apartments. Aldrovandi Residence City Suites provides studios, 2-room and 3-room accommodation, all with air conditioning, heating and satellite TV.